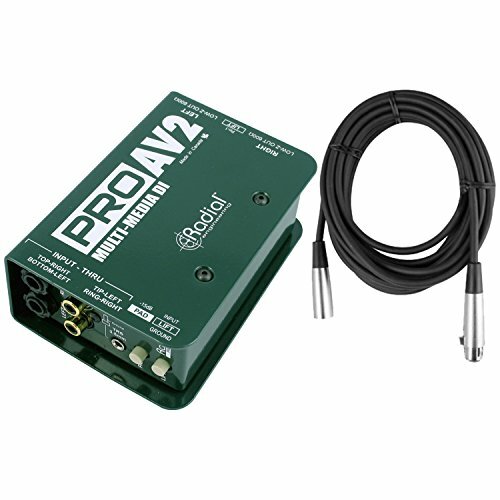 The Radial ProAV1 and ProAV2 are passive direct boxes specifically developed with the audio-video integrator in mind. The ProAV1 features a variety of stereo inputs that are summed mono via a resistive mixer, greatly simplifying signal management. The ProAV2 delivers two discrete channels where full stereo functionality is required. To eliminate the need for various adaptors, both units are equipped with a 'Swiss Army' array of connectivity options including 1/4" inputs for instruments, RCA and 3.5mm (1/8") connectors for CD players, iPods, video decks and computers. The ProAV1 also features a female XLR input for interfacing equipment with +4dB professional signal levels. The front panel connectors can also be used as thru-puts to allow multiple patch points. Custom wound Eclipse ET-DB2 transformers are able to withstand exceptionally hot signal levels while maintaining linearity from 20Hz to 20kHz. The resulting smooth Bessel curve is warm and natural, making them particularly adept at handling digital sources that can sound harsh. Transformer isolation further benefits by eliminating hum and buzz caused by ground loops or DC offset problems.